As people age, one of the most dangerous areas of the home becomes the bathroom. With slippery tile floors and sleek tubs, the potential for a deadly fall is greatly increased, especially for disabled or frail seniors. The shower in particular is a problem, as over two-thirds of bathroom injuries in seniors happen in or near the bathtub. One way to combat these pernicious problems is the use of a shower chair. A shower chair is just what it sounds like – a chair which seniors can sit in while showering. It is specifically designed to fit inside a tub and provide a stable and non-slip surface for the elderly to rest on. Choosing a shower chair is not an easy feat. There are a variety of them available on the market, all with different features and selling points. It is important to consider all of these different factors before choosing the shower chair that is right for you. Unfortunately, there is no universal size standard for bathtubs, so its important to measure your tub to make sure the shower chair will fit in it. Also consider the overall size of the bathroom and whether or not you have a door on your shower. An overly large chair in a small bathroom will probably do more harm than good. Many chairs have adjustable legs, but often the base seat is not adjustable, so it’s important to determine if it is too wide or not. Follow this guide to determine the exact dimension of your tub. While the idea of a shower chair is basic enough, the actual usage of it can vary. Some people also use their shower chairs for aqua therapy, saving them the trouble of buying another device. Additionally, for those who have degenerative or unreversible physical damage, shower transfer benches can be incredibly useful. 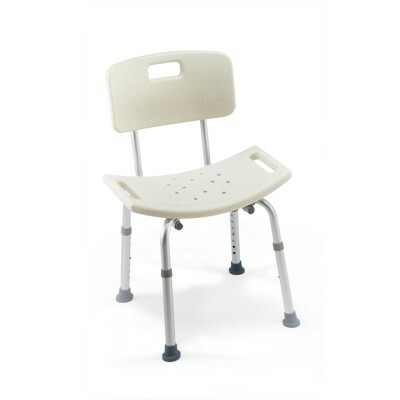 This allows users to enter the bathtub while remaining in a seated position. Lastly, consider how many people are using the tub. If the senior is not the only one using the bathroom, a foldable shower chair is very useful, as it can be removed and put away when needed. Choosing a shower chair doesn’t have to be all about necessity. Because the market is so large, there is room for individual preference as well. Shower chairs are typically available in teak or plastic, as these are durable materials that will stand up well when exposed to water. Some chairs offer other features, such as a splashguard to keep urine flowing into the toilet, head support to offer lateral side head comfort, and armrests for relaxing and maintaining balance. The choice is up to you. Not all shower chairs are intended for all users. Many have weight or height restrictions, so its important to find one that fits you. The typical chair holds a weight of 250 to 300 pounds, which should be sufficient for most users. However, there are specialized bariatric chairs that can support a weight of up to 500 pounds for larger users. As for height, most seats can be raised up or down to provide perfect positioning. To determine an exact fit, you may need to take your measurements and compare them to that of the chair. If you’re still a bit confused about which shower chair is exactly right for you, don’t be afraid to ask us! Your occupational therapist or nurse can discuss your needs with you and offer a personalized recommendation. They may even be able to assist you in ordering equipment. And if you still feel uncomfortable getting in and out of the tub, you can request a home health aide to come and assist you during your shower. Unfortunately, Medicare does not cover the cost of shower chairs, so you will be responsible for paying for it on your own.